download our wireless hacking cheat-sheet! Encrypted Wi-Finetworks are private spaces carrying simple radio waves into the ether. Still, they can be received with normal equipment in public space, far beyond your apartment’s room. Who and what is claiming the ether? Are waves an emerging transmission carrier reshaping the definition of public and private space? Sometimes we can still enjoy the luck of finding an open Wi-Fi network that some generous geek left free or occupied house-wife forgot to secure. Sadly, most recent wireless access points come off the shop shelfs being pre-configured with rather strong encryption. We believe that regardless the settings the devices sold with, people still might not mind us using their wireless for the common good. All we need to do is to help them share it. On another hand the concept of wireless security is a flaky topic to begin with. Anything what is in the air (like the radio waves) can be captured and decoded. There are no barriers for anyone to tap into anyone else’s radio network and with the power of modern computers cracking the encryption takes very symbolic time to complete. 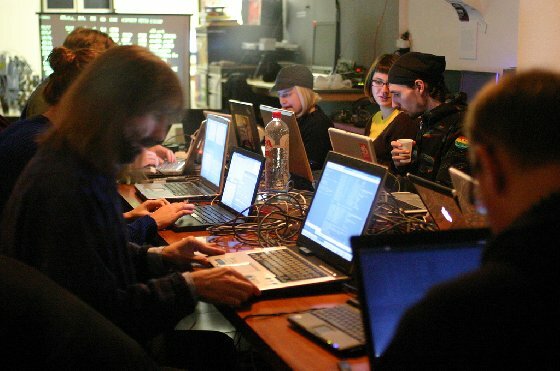 The workshop will showcase the ease of cracking WEP/WPA wireless network encryptions as a way for understanding the risks of Wi-Fi networks and will provide participants with handy computer skill for the precarious offline times. Further on, easy ways of securing your own wireless environment will be taught. The workshop will be accompanied with a dinner by charming Bruno, our “moddr_ cook” in residence. >> you all make the world a better place. WHERE? – moddr_lab, Willem Buytewechstraat 188a, Rotterdam, Netherlands [find_us]. Amount of places is limited, please contact us at workshop [at] moddr [dot] net if you would like to participate.